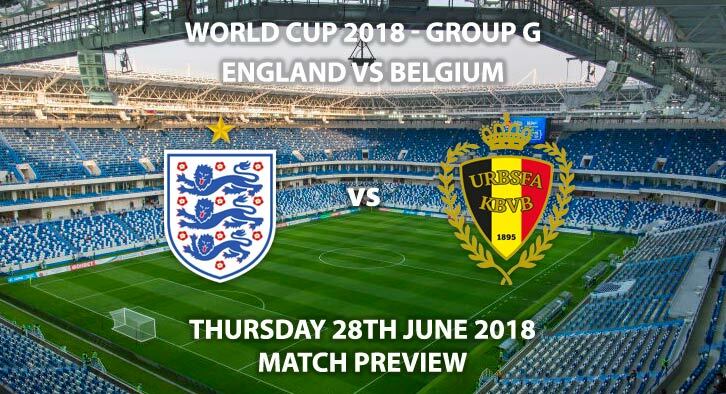 England vs Belgium – With both sides already safely through to the last 16, England and Belgium will battle it out for top spot in Group G.
England ran riot against Panama on Sunday, with a stunning 6-1 win. The Three Lions were 5-0 up at the break before Harry Kane completed his first World-Cup hattrick in the second half. Those goals took the Spurs striker to five for the tournament, making him the competition’s leading scorer. Jesse Lingard scored the pick of the goals with a fantastic curling effort from outside the area, whilst John Stones scored a brace of headers. With eyes on England’s potential RO16 opponents from Group H, many have suggested finishing in second place could be more beneficial. Group H’s final games kick off at 3pm the same day, meaning England will know their potential paths in the knockout rounds depending on where they finish. They currently top the group on fair play, having received one less yellow card than Belgium. Both sides have identical points, goals scored and goals conceded. If it turns out England would prefer to finish second, we could see a flurry of yellow cards, if the scoreline is a draw. Gareth Southgate may also be tempted into resting some key players, with little riding on this game. Belgium also secured their place in the knockout rounds in emphatic style. Romelu Lukaku and Eden Hazard both grabbed two as they won 5-2 against Tunisia. However, the pair were withdrawn after 65 minutes after picking up minor knocks that could see them rested against England. Roberto Martinez is expected to make mass changes, to keep his squad fresh for the latter stages of the competition. Damir Skomina is the referee for this game. The Slovenian took charge of the Three Lions embarrassing defeat to Iceland, just two years ago. He has averaged 4.12 yellow cards over 145 international games. Therefore, I would advise a maximum booking points total of 40+. Knowing Southgate, he will want England to go and win the game, irrespective of their potential RO16 opponent. Winning breeds confidence which therefore helps to build momentum. Although, with that being said, neither side will risk any injuries, which could see a slower-paced game. I personally think both sides will settle for a draw. Draw 1-1 – (link no longer available). Both Players to Score – Batshuayi and Kane – 6/1. – Both nations talismans, they will both get chances to score in the match. 1st Goalscorer – Marcus Rashford – 6/1. – The flair, pace and deadly finish that this guy possesses makes him the best player on the pitch. He will be determined to sink the Serbians early on. RequestABet Specials Up to 10/1 – England to win & BTTS – 9/2. RequestABet Specials 80/1 and above – Draw 1-1, 3+ corners each team and no booking points – 125/1. (0.25pt Outsider). RequestABet Specials 80/1 and above – Draw 0-0, and no booking points – 125/1. (0.25pt Outsider). RequestABet Specials 80/1 and above – Draw 0-0, under 12 corners and 30+ booking points each team – 100/1. (0.25pt Outsider). Tips updated at 17:40 GMT on 28th June 2018. Markets unlikely be updated again prior to the game kicking off.